The #1 driver of event ROI for attendees and sponsors is the number and quality of the meetings that sales and marketing teams drive before and during the event. We want everyone to crush their goals so we’ve compiled this list of unique ways to book more meetings at B2B events. Whether you’re attending B2B Marketing Forum, Dreamforce, CES, or any other quickly approaching conference or event, these tested tips will help sales and marketing teams book better meetings at whatever events they’re attending. Having attended Cannes for years, our CEO and COO knew that one key driver is that everyone really comes for the parties and stays for the meetings. With help from the event Facebook groups, we put together a blog post titled “Top Cannes Parties 2017”. We shared it with these groups and generated over 2,500 views from two Cannes-themed FB groups! Because we engaged with the group on Facebook and discovered other parties happening and then shared it with that community, we were able to generate a ton of views to our blog and convert some of those views to meetings. To be honest, we should have locked this piece of content as it was so incredibly valuable to attendees and was our most popular blog post to date. Who’d have thought a bunch of advertising and creative folks like to party so much? Creating content around events is a super easy way to book better meetings. Is a leader at your company speaking? Write about that! Is everyone always confused about the layout of this particular conference hall? Create a map. There are several unique ways to create content around events that will help your team book more meetings. Event sponsors have been creating AdWords campaigns against event-based keywords that point to a landing page asking for a meeting for years now. However, we’ve noticed companies tend to launch these campaigns 2–3 weeks before the event which drive up the cost of the event-based keywords. 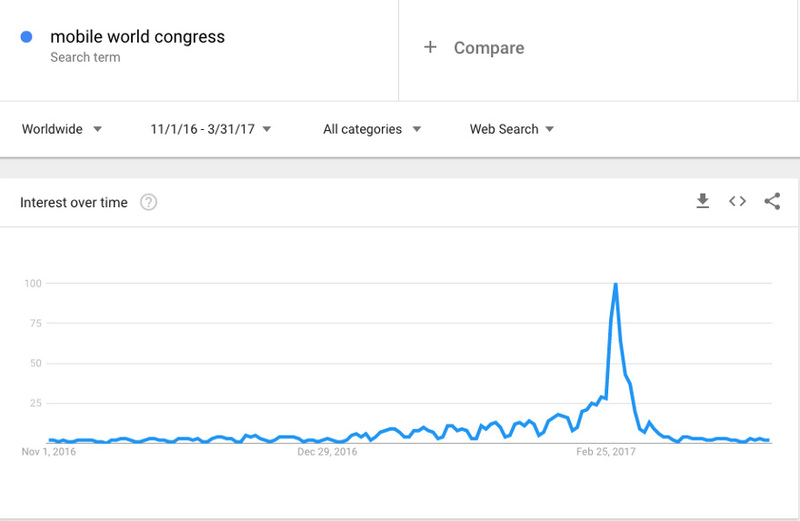 But the rise in searches tends to start as far back as eight weeks before the event. Benefit from these early searches by creating a PPC campaign to book more meetings at the event. You’ll save money and can retarget the clicks that don’t convert in a few weeks. There are some really great social media SaaS tools out there, don’t get us wrong. 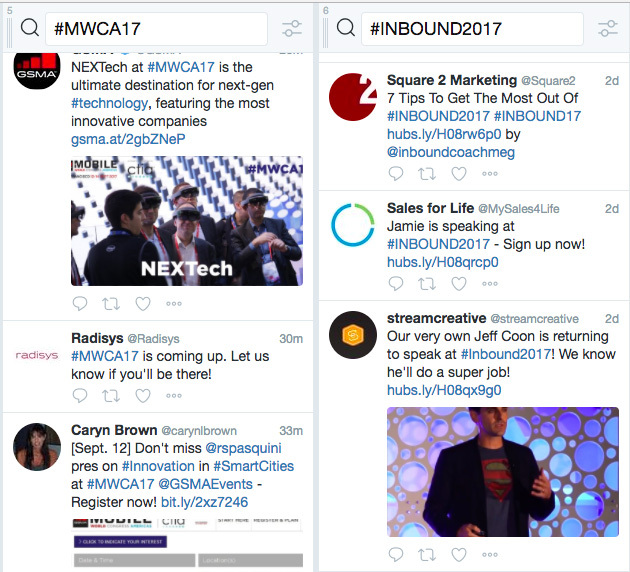 But we’ve found the best way to keep up with the boom of event hashtags right before the event is with Tweetdeck. It’s an easy way to see who is attending and reach out to book some meetings at B2B events you’re attending. We also highly suggest looking for versions of the official hashtag. For example, people attending Mobile World Congress were using the official #MWC17 tag but also using #mobileworldcongress2017, #mwc and #mobileworldcongress as well. The unofficial tags will have less people using them but are great opportunities to filter through the noise. We’ve all read (and probably posted) the “I’m attending THIS EVENT. Comment below if you’re attending or click this link to book a meeting with me!” status update on LinkedIn. But we suggest asking your LinkedIn network if they know anyone attending. By asking if your connections know anyone attending, they’ll let you know if they’re attending while also presenting the opportunity for some brand new connections. Warm introductions are the best introductions so this really pays off! We’ve downloaded pretty much every major event app out there and our biggest critique has nothing to do with the actual event app—It’s when event attendees and sponsors have blank profiles in the app! Stand out from the crowd by uploading a nice headshot, a bio mentioning who you’re interested in meeting at the event, and a clear, correctly sized version of your logo. Be sure to login to the app once a week leading up to the event to make sure you haven’t missed any connections or opportunities. For example, dmexco is quickly approaching. G2Crowd, Domo, InsideSales.com, SalesLoft and LiquidHub are a few of the sponsors of dmexco. 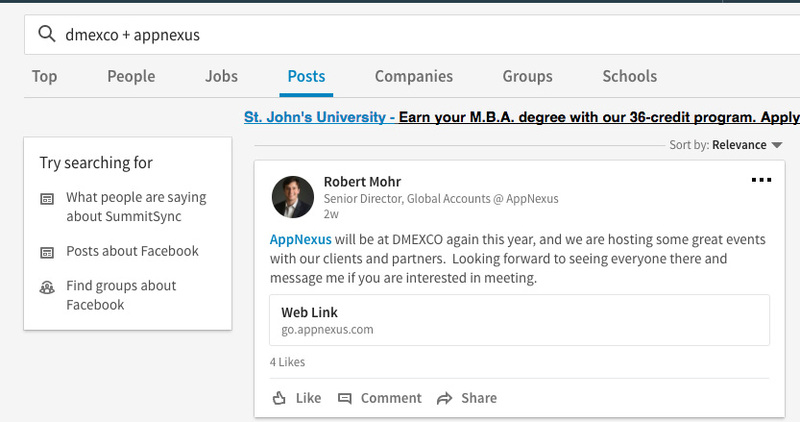 If you search “dmexco + Appnexus” on LinkedIn, you’ll find posts that mention both the sponsor and the event. Generally, these posts tend to be by the actual folks attending the events asking for meetings. It’s an easy way to see exactly which employee is attending an event and book a meeting directly with them. People who like the event page are more likely to have either gone in year’s past or are attending this year. When setting up a Facebook ad for booking more meetings at the event, click “narrow audience” and enter the event name. This will narrow your reach to “all other targeting details + must like event page” so you’ll limit reach to only those interested in the event enough to express social signals. It’s great to promote a piece of content about the event in the ad to show relevancy and hopefully increase virality through social sharing. Paying to book meetings at B2B events is the last thing your sales and marketing team should implement. Make sure the team is squeezing every drop of juice out of organic, unpaid ways to book more meetings. We believe in helping sales and marketing teams drive a higher return on event (ROE) and believe the number one way to do that is to book better meetings at B2B events. The SummitSync platform is a valuable tool for sales and marketing teams to use at B2B events—our meeting automation platform makes it easy for your team to schedule and manage more meeting and drive more revenue.